ElKhoury Law Firm has distinguished itself as a highly reliable and effective law firm in Lebanon, very well known in the legal and business communities. This reputation has been hard earned through decades of competent and loyal service to its clients and through a devotion to excellence and integrity in every case. The firm persevered and cemented solid relationships in the legal and business communities not only in Lebanon but in countries all over the Middle East. ElKhoury Law Firm offers extensive local experience to help its clients react quickly, decisively and with confidence to problems as they arise. Since its foundation, with its first founder in the 1950’s, the firm has remained at the side of its clients despite and throughout Lebanon’s civil unrest and political turmoil and helped clients survive and navigate through difficult times that brought the ruin of many, and then helped its clients take advantage of new opportunities in times of economic recovery. ElKhoury Law Firm is highly integrated into the legal system in Lebanon in which it has developed deep and extensive roots over the years and, at the same time, developed a familiarity with the workings of the legal systems in the Middle East (including the Gulf countries). 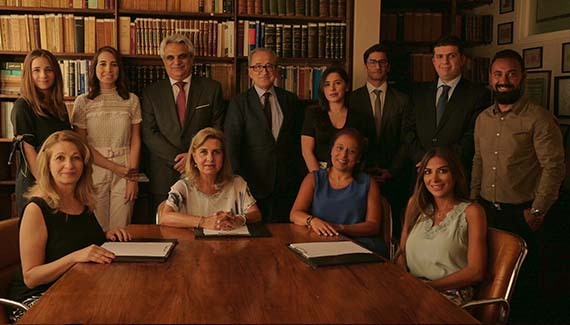 Some of its attorneys hold distinguished positions outside of the firm- including professorship at the University Saint Joseph Law School and membership in professional committees at the Beirut Bar Association and at the Banking Association and other ad hoc committees. As a result, ElKhoury Law Firm has acquired a comprehensive understanding an excellent sense of the political and business currents underlying a legal case, and the expertise and knowledge to safely and properly steer its Middle East clients. It is intimately aware of the directions the legal system has evolved into the uniquely complex political and cultural mosaic environment that is the Middle East. Such understanding of this constantly shifting social and political evolution is critical for a proper assessment of to the prevailing laws, their implementation and enforcement, and to enable the provision of safe and relevant legal advice and assistance. Our firm is permanently seeking to offer real practical solutions to problems and not just technical legal references. We are one of the premier transactional firms in the area. We represent the interests of large foreign multinationals, including Fortune 500 companies, providing services such as corporate legal assistance, protecting trademark names, establishing franchises, enforcing trusts, drafting shareholder and joint venture agreements and coordinating investments and financing with banks and investment funds. We are heavily involved in construction and in real estate deals and have been extensively associated with the development of some of the largest joint ventures in the country involving both national and international firms. ElKhoury Law Firm is able to combine its local strength and international understanding to provide unique representation due to the extensive and diverse skills of its attorneys, honed over decades of experience. Our attorneys are multilingual, and can carry out and conduct legal work and proceedings in more than one language. Our firm combines the talents of attorneys who have graduated from the best law schools in Lebanon, who have obtained higher degrees in France, and who have graduated with a JD and are members of the Bar Associations of the United States and France. Our firm is comfortable handling transactions and litigation rooted in the civil law or the common law systems. Our attorneys are trained to work together on cases in order to tackle problems from a diversity of angles. Each attorney contributes his or her specialized experience to a specific case. Senior attorneys supervise the work of junior attorneys on every case. As a combined result, every case will benefit from a wealth of quality experience. Every case is important to us, and the effort and quality of work we put into each case represent our professional pride and reputation. It also means that the development of our attorneys is paramount to us, so that we may continue to provide quality representation from generation to generation. That we invest in our clients and in our attorneys is a sign of the care we take in forming our institution and the loyalty upon which it is build. The quality of our representation stems from the attention we bring to each of our clients. We value them, and in turn, they value us. Whether we are advocating for an individual’s rights or bringing added value to your company, our dedication to our clients is complete. The quality of our representation is rooted in our ability to truly listen to our clients so as to ascertain both the broader context of the problem as well as the details that will give us the necessary edge for our client’s interests. Our success depends not just on our knowledge of the law, but on our judgment, creativity, professional wisdom, and experience in offering advice that is pragmatic and solution oriented. Our constant availability and attention to our clients is what earns us their loyalty and their faith in our judgment. Loyalty is the mortar that holds the members of our firm together. The atmosphere of cooperation at the firm has been fostered by years of working together. Most of our senior attorneys have been in the firm for over twenty years. Our clients' legal interests constitute our main concern. Clients who have consulted with us come back bringing their business partners or family members. Our clients look to us for guidance through complex legal transactions over several years, and through ongoing business relationships. Our doors are always open, whether to look over a given contract, go over the results of a meeting, exchange views over a new development in a case, or simply seek strategic advice. We are delighted to have been given the opportunity to present our Firm’s profile and looking forward to be of assistance to you and your Company whenever needed.